While many homeowners assume flashing is a part of the roof, it is equally important to the chimney. Because of its location, flashing protects your chimney, roof and the surrounding building materials from water damage. If your flashing is damaged or was poorly installed, water can quickly create serious damage throughout your home. Flashing is the watertight strip that connects your roof line with the masonry of the chimney. Typically made by layering metal (such as aluminum, copper or stainless steel) with water barriers and caulk, flashing plays an important role in keeping water out of both your chimney and home. When correctly installed and regularly inspected and maintained, chimney flashing can last for 25 years or longer. However, if your flashing was not correctly installed the first time, it may deteriorate faster or cause chimney leaks. Flashing should always be custom-fitted to your home, chimney and roof line; this ensures that there is a watertight seal with no gaps or holes for water to enter through. Likewise, care should be taken when installing flashing. Nails or screws should be used sparingly to prevent the creation of holes where water can enter. Strong winds, animals or long-term exposure to the elements can all cause damage to your chimney flashing. Because of this, it is important that your flashing be inspected each year as part of an annual chimney sweeping and inspection. This annual maintenance can help prevent leaks and make sure your chimney remains in good condition year after year. If you notice water staining on the walls and ceilings around your chimney, call a chimney sweep before you call a roofing company! Oftentimes leaky flashing can mimic the symptoms of a leaky roof, including damage to shingles, roofing materials and underlying beams and eaves. 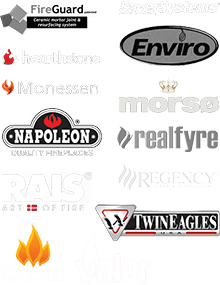 Before you call a roofer and spend hundreds – if not thousands – of dollars on roofing repair, call Olde Towne Chimney & Fireplace Sales to have your chimney evaluated. The flashing, not your roof, may be what’s leaking! Don’t Trust Just Anyone To Repair Your Flashing!  In order to make sure your home’s flashing is properly installed and has a long-lasting, watertight seal, schedule an inspection with the experts at Olde Towne Chimney & Fireplace Sales — call 812-284-0123 or click here! Waterproofing your chimney is another way to repair or prevent leaky chimneys. Let the pros at Olde Towne Chimney take care of it today!